Rhodes in addition to the buildings related to the Knights of St John, retains many memories of the Ottoman, Greek and Jewish communities who lived there for centuries. In 1480 Sultan Mehmet II, who had conquered Constantinople in 1453, did not succeed in doing the same with Rhodes: two years later, his son Prince Cem made his grand entrance into Rhodes: not as a conqueror, but as a guest. In 1481 Sultan Mehmet II died while he was on his way to make another attempt to seize Rhodes: his son Bayezid II was declared Sultan, but Prince Cem, one of his younger brothers, who was ruling two provinces in central Anatolia, proclaimed himself Sultan of Anatolia: however his troops were soon defeated and Prince Cem fled to Egypt. In 1482 he landed again in Anatolia and tried to raise a revolt against the Sultan. This second attempt also ended in failure and Prince Cem sought refuge in St Peter's Castle (today's Bodrum), the fortress the Knights of Rhodes had on the Asian coast opposite Kos. Grand Master d'Aubusson invited him to Rhodes where he was received with great honours: a XVIth century miniature shows his arrival at Emporium: St Catherine's Gate and the fortifications of the harbour are clearly visible. The dynastic quarrel between the two brothers was a golden opportunity for the Christian nations to weaken the Ottoman Empire, but they missed the chance. Sultan Bayezid II bribed Grand Master d'Aubusson to convince him not to help Prince Cem in making a third attempt to threaten his throne: the prince was sent to a castle d'Aubusson had in Auvergne where he was kept as a prisoner of high-rank. It was not until 1489 that d'Aubusson was forced by Pope Innocent VIII to free Prince Cem who was allowed to reach Rome. In return the pope rewarded d'Aubusson with a cardinal's hat: this explains why the Grand Master's coats of arms after 1489 have the insignia of a cardinal. The pope had in mind to propose Prince Cem join an alliance with the kings of Naples and Hungary against Sultan Bayezid II; the latter however was swift to react and by a stroke of genius he managed to bribe even the Pope by sending to Rome part of the lance by which St Longinus pierced the side of Christ on the Cross. The crusade to free Constantinople never materialized and eventually Prince Cem died in Naples in 1495 (he was buried in Bursa). In 1516-17 Sultan Selim I expanded his empire eastwards by conquering Syria and Egypt: this made it crucial for the Ottomans to control the route between Constantinople and Alexandria: the route was threatened by the Knights of Rhodes, who often acted as Christian corsairs and attacked the Ottoman convoys. In June 1522 Sultan Suleyman I declared war on the Knights of Rhodes and soon after a large Ottoman army landed on the island: the invaders occupied a hill to the west of the town (the site of the acropolis of Ancient Rhodes) where they placed their cannon. The Knights defending Rhodes numbered 650 and they could rely on an overall force of approximately 7,000 soldiers; the Ottomans were estimated at more than 100,000. The fortifications withstood the effects of the Ottoman cannon and the whole summer passed without the attackers making significant progress; by the end of September the Knights thought they had managed again to survive a siege: the Ottoman army was usually disbanded at the end of summer and reconvened the next spring; in addition Pope Adrian VI appealed to the Christian nations to help the Knights. Sultan Suleyman understood that by withdrawing from Rhodes he was putting his own authority at risk and he kept on with the siege; the Christian nations were more divided than ever because of the Reformation: the papal calls fell flat. By December the Ottomans breached the walls near St Athanasius' Gate and were ready to launch a final assault: Sultan Suleyman however knew that in 1480 in a similar situation the assault ended in defeat; in the other camp Grand Master Philibert Villiers De l'Isle Adam was left with only 180 knights and little hope of receiving help. The two sides started negotiations and on December 20 an agreement was reached: on Christmas' Day the Ottomans entered Rhodes and on January 1, 1523 the Knights and the Catholic inhabitants left the town carrying with them their banners and their holy images; the terms of the agreement included also the surrender of the Knights' fortresses in Kos and St Peter's Castle. The Ottomans settled in the walled town while the Greek inhabitants had to move to Neo Chorio (new town) the site of today's modern Rhodes. The churches were turned into mosques: the main street of Burgo became the heart of the town; typical Ottoman balconies were added to the houses. While on many Aegean islands (Chios, Mytilini) Muslims were forced to leave by the 1923 agreements between Greece and Turkey for the exchange of population, in Rhodes there is still a Muslim community with their own cultural and religious institutions. The Byzantine churches which were turned into mosques or madrases (Islamic schools) have been brought back to their original appearance, although in some cases a portal or a truncated minaret shows their use during the Ottoman period. A 1929 Italian tourist guide so described the Jewish quarter of Rhodes: Beyond the Admiralty we enter the Jewish quarter where the atmosphere is so different from that of the Muslim quarter: the latter is very silent with family life going on behind closed doors, the Jewish quarter is happily noisy with children screaming and the open doors allow to see women doing their chores in rooms and courtyards. That is all gone: on July 23, 1944 the Nazis raided the quarter and deported all Jews; the quarter was bombed during the last months of WWII which in Rhodes ended only in May 1945. 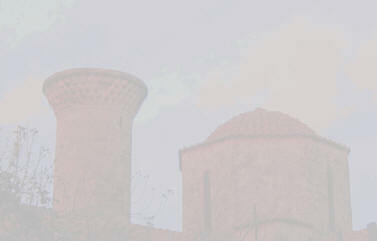 The image used as background for this page shows Agia Triada and its truncated minaret.